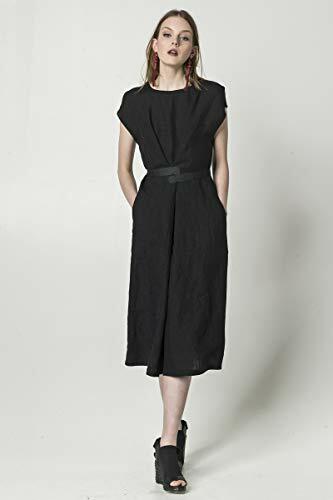 Black linen dress with pockets. This dress is both amazingly elegant and functional: it has clean collar and outlining bell shape as well as two side pockets. You're also able to transform the dress with sewn-in belts: tie them at the front for chic look and loose pleats or join them at the back for more laid-back silhouette. You can opt for black cotton belts or stick with linen. The versatile nature of the dress makes it the perfect choice for nearly any occasion. Light linen and short sleeves give you an opportunity to look exquisite even under the hottest conditions, or pair it with a stylish jacket for a bomb combo. - colors in photos: black. You can choose other colors from our color card. - the model is size S 177 cm-5'8". In the photos, she is wearing the dress sample in size M.
- we are just starting on Amazon Handmade but we have more than 1300 sales and over 300 almost exclusively five-star reviews on Etsy (https://www.etsy.com/shop/d96p?ref=l2-shop-header-avatar). So, you may shop with confidence.